(Seattle, WA) March 2, 2016- Washington Brewers Guild will present its annual Washington Cask Beer Festival at the Seattle Center Exhibition Hall on Saturday, March 19. The event is one of the longest-running and largest beer festivals that focus exclusively on cask-conditioned beer. Once feared it might become an antiquated art on its way out, cask-conditioned beer is still cherished, and even gaining popularity here in Washington State thanks to continuing efforts by many brewers and pubs committed to keeping cask beer flowing. 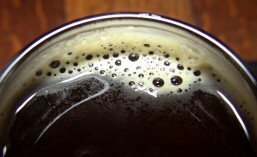 Cask-conditioned beer is unfiltered and unpasteurized beer that still contains live yeast. It finishes secondary fermentation once the beer is transferred to a “cask” where it is naturally conditioned and carbonated without artificially introducing CO2. Beer is then served straight from the cask by gravity or a hand pump at cellar temperature (50-55F). Result is a smooth mouthfeel and fuller flavors thanks to lower carbonation and warmer temperatures. It’s no secret that we love hoppy beers at the Cask Festival. Many brewers decided to add even more hoppiness to their beers by dry-hopping them to the max. Anacortes Brewery dry-hopped both of their IPA’s while Hale’s Ales Brewery (extra) dry-hopped their Supergoose Double IPA and Maritime Pacific Brewing dry-hopped their Hop Surge Triple IPA. Cask-conditioned beer originated in England centuries ago. Some brewers chose to pay homage to the roots by brewing classic English style beers including Knuckle Boom ESB by Beardslee Public House, English Brown Ale by Paradise Creek Brewery, and 2-Bit Bitter by NW Peaks Brewery. Brewing beer with fruits is quite common but the choices of fruits for this year’s Cask Festival are decidedly sunny and tropical while we anxiously wait for the arrival of spring. Try Peach Sour by Silver City Brewery and Peach Berliner Weisse by Schooner Exact Brewing, Treasure Island Pale Ale with passionfruit by McMenamins, and Grapefruit IPA by Mac & Jack’s Brewing and Grapefruit Keller-Kolsch Radler by Bainbridge Island Brewing. There are many beer styles that are suitable for cask-conditioning and Oatmeal Stout is definitely one of them. Its smooth mouthfeel is accentuated and roasty chocolate, coffee notes come through nicely. Try Yardam by Island Hoppin’ Brewing, Built for Comfort Stout by Rainy Daze Brewing and Over and Out Oatmeal Stout by Fish Brewing, and Rooftop Brewing’s version. Apple-Cinnamon ESB, a Cask Festival People’s Choice Award reigning champion by Diamond Knot Brewing will once make an appearance at the event. This beer won the first place for the second session in 2015 and has won more People’s Choice Awards than any other beer in the festival history. North Sound Brewing’s Cheeky Monkey Brown Ale which won the second place for both sessions last year will also return. This year’s Herbert’s Legendary Cask Festival Ale was brewed at newly re-branded Mollusk Brewery. Herbert’s is a collaborative beer that is brewed every year at a different host brewery in honor of Bert Grant, a Northwest craft beer icon. It is a tradition that truly exemplifies the spirit of the Washington brewing community and has been treasured by many Cask Fest enthusiasts. This year’s Herbert’s was brewed with Washington grown and processed malt, and each participating brewery was asked to bring a pound of their favorite hop. The result is a medium bodied Pale Ale with an intense bouquet of hops from around the world. The beer will make its debut prior to the Cask Festival at the release party hosted by The Latona Pub (6423 Latona Ave NE, Seattle, www.3pubs.com) on Wednesday, March 16. The Cask Festival will host two sessions; from noon to 4pm and 6pm to 10pm on Saturday, March 19 at the Seattle Center Exhibition Hall. Admission is $40 in advance or $45 at the door, if tickets are still available. This event may sell out so advance purchase is recommended. Separate tickets are required for each session. Admission includes a commemorative tasting glass and up to 25 sample tastes. Tickets are available online at www.washingtonbrewersguild.org. This is a 21-and-over-only event. Bourbon Barrel Old Scrooge—Limited quantity. Arrive early! Peach Sour (Sour) —Limited quantity. Arrive early! *Available to WABL members only. 21 and over only. Non-refundable. No Dogs allowed. Tickets are on sale online at www.washingtonbrewersguild.org. This event may sell out so advance ticket purchase is strongly recommended. Washington Cask Beer Festival is a major highlight of the Pacific Northwest beer festival scene. It’s a rare opportunity to sample over 100 mostly exclusive or limited release cask-conditioned beers from 40+ Washington breweries. To stay true to the tradition of cask-conditioned beer the Festival requires brewers to naturally condition the beer in a firkin or other vessels without artificially introducing CO2. All beers will be poured by gravity or via a beer engine and the result is smooth ale with a thick creamy head that brings out subtle, nuanced flavors. Also featured at the event is the Herbert’s Legendary Cask Festival Ale, a special cask beer brewed collectively by the Washington brewers in honor of Bert Grant, a legendary Washington beer icon. This year’s Herbert’s was brewed at Mollusk Brewery in Seattle. Brewmaster’s Bakery—Granola and other baked goods made with spent grain from WA breweries. Ticket sales for this year’s festival have been going strong and the Washington Brewer’s Guild announced just the other day that there were only about 200 tickets left for the festival. The first session is expected to sell out soon, so don’t delay. Get your tickets today. This entry was posted in Beer, Brewing, Cask, Cask Fest, Events, Festivals, Food, Local, Seattle, Seattle Center, Spring, Washington, Washington Beer, Winter and tagged 2016, beer, Cask Fest, events, festivals, March, Washington Brewer's Guild. Bookmark the permalink.